Complex of semi-detached houses all with private entry and garden, situated about 650 mt from the beach. There is a large swimming pool, at about 130 mt from the house, for adults and one smaller for children and a playground as well. This house is situated on the first floor with gazebo, barbecue and a garden. 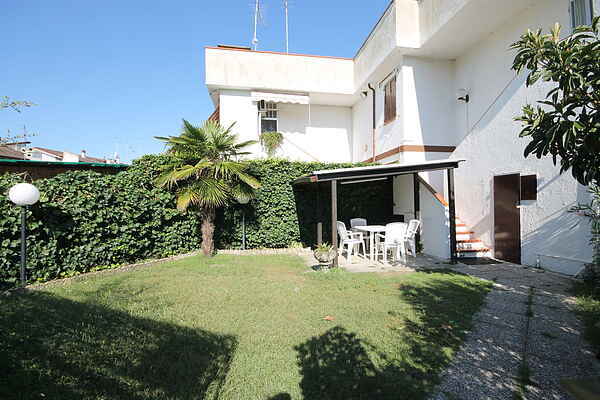 The house is situated in Lido delle Nazioni, a touristic place at the seaside, with a lot of shops, restaurants and clubs. The Lido offers many attractions for young and sportive people: discos, football fields, two riding schools and a sailing school, where you can practice canoeing, rowing and water-skiing. Lido delle Nazioni is located at 100 Km from Venice, 100 Km from Rimini, at 80 Km from Bologna, 50 Km from Ferrara and 40 Km from Ravenna. Small and medium-sized dogs are accepted. If you want to reach Lido delle Nazioni using public transportation you can: - Come directly by bus from the cities of Milan, Turin and Bologna; - Take the train to Ferrara and then take the bus to Lido delle Nazioni; - Travel by airplane to Bologna, Forlì or Rimini and then take the bus to Lido delle Nazioni.